Following a successful native launch, my team began efforts to massively scale Venmo checkout by connecting to merchants already using PayPal’s web checkout platform. At this early stage in the product’s lifecycle, our primary goal was to avoid fragmenting the experience across implementations. We believed firmly in the value of consistency, so in mobile web we aimed to connect to or match the native experience. How might we present both payment paths clearly to shoppers? How do we ensure the new Venmo option doesn’t diminish conversion for merchants? How do customers perceive the relationship between PayPal & Venmo? At the outset of this new initiative we collaborated with PayPal’s product teams, identifying a low-risk path connecting Venmo payment options to PP transaction processing. This addressed the payment processing mechanics and merchant tools, but not the customer experience. We next designed and prototypes a new activation flow in Venmo that guided users through set-up. 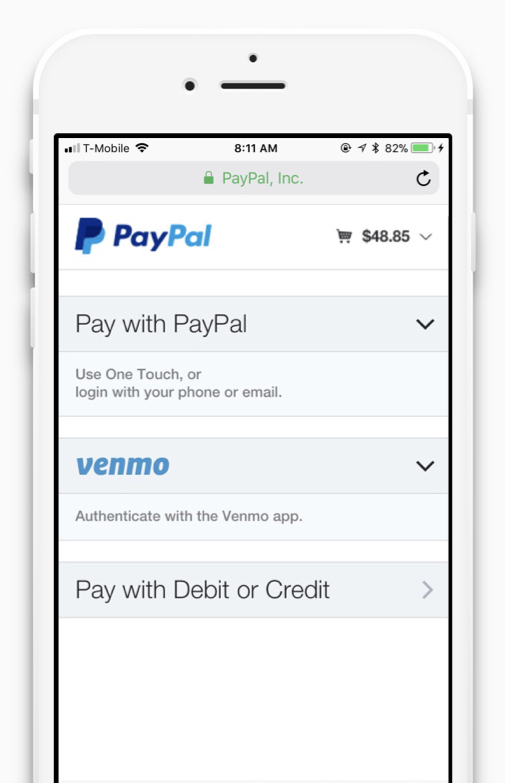 The experience informed users that they could purchase from PayPal merchants using their Venmo wallet. Co-branding was riskier: Venmo’s mobile web checkout experience would be the first tangible instantiation of the corporate relationship between PayPal and Venmo. Both checkout teams worked together to dig into the consumer and merchant perceptions about paying with Venmo via PayPal. Our user research program would investigate how each segment — PayPal & Venmo consumers, and PayPal merchants — reacted to the brands presented together. We set out to discover how presentation order and visual hierarchy effected perception. We also tested whether each path would make sense to its users. Research validated a hypothesis we had about overlapping user bases: they are sophisticated consumers who purposefully choose which brand to use based on what they’re buying and who they’re purchasing from. It presents both options together, allowed users to choose their path without an additional tap. Presentation order and default path adapts to preferences of recurring users. With a high-level approach to activating customers and processing payments in hand, the teams refined the scope of our research. 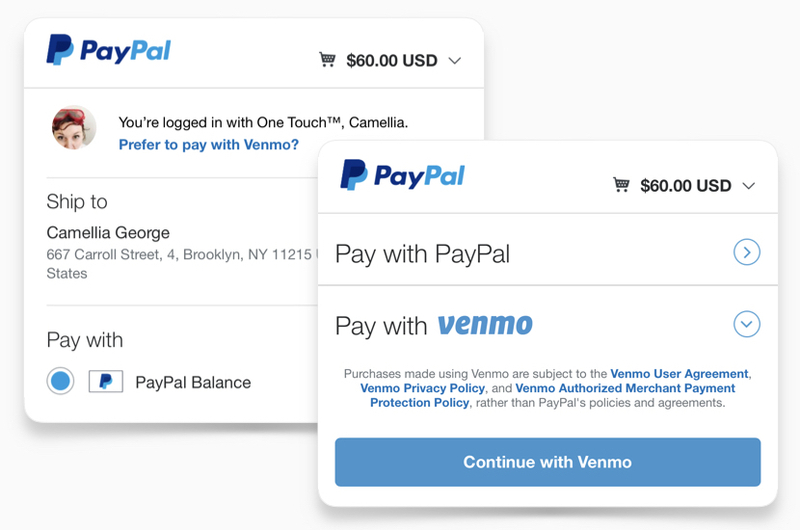 We tested variations on a stacked pattern that showed both PayPal and Venmo to assess whether users could easily discover the Venmo option within PayPal’s interface. 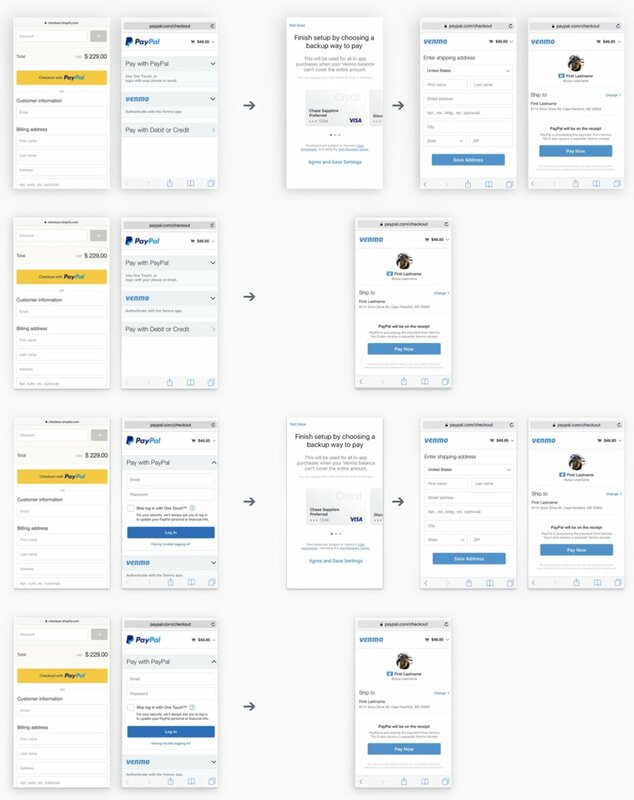 While designing and building this checkout experience, we also began defining how Venmo would integrate with PayPal’s operational platforms (like fraud detection). Venmo would certainly benefit from PayPal’s mature support and risk operations through this integration. I also hoped Venmo’s participation would these investments evolve from a monolithic stack to set of more flexible microservices. Helping these established platform services benefit from Venmo’s additional behavior data and use cases required evangelizing for the business value of Venmo’s unique usage. It also required cooperating with PayPal’s architectural board on novel technical solutions to deliver those differentiated experiences. Through a series of “roadshows” at headquarters and in-depth working sessions, I defined the technical integration and business goals for the integration program. I helped dispel the notion that Venmo was a PayPal clone with a different logo and invited PayPal staff to join in as champions for Venmo’s success. 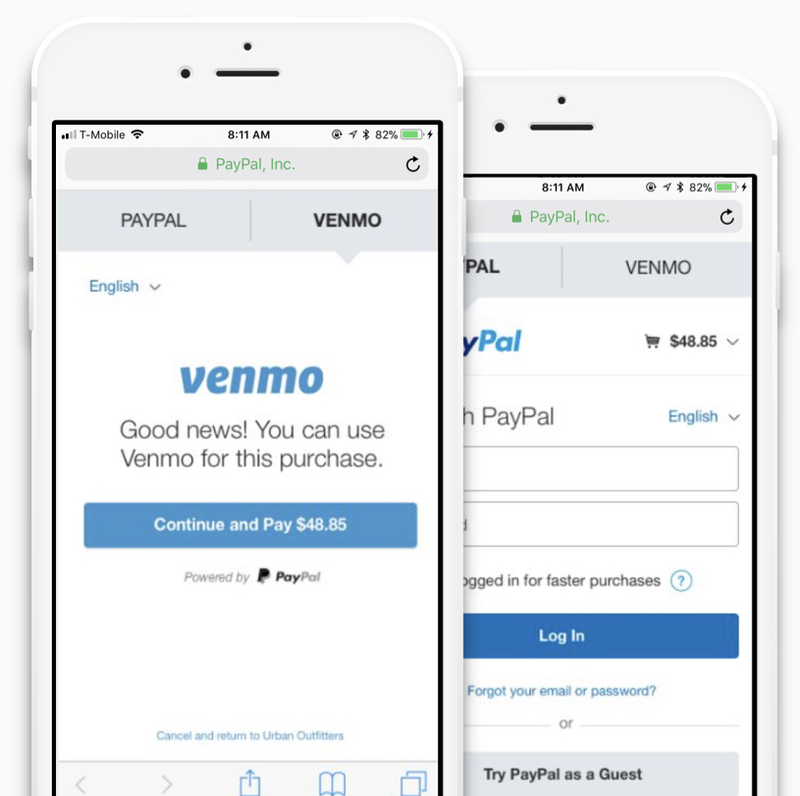 Venmo launched in 2017 as a payment method on mobile web for all domestic PayPal merchants. The experience dynamically presents the most relevant payment brand, reflecting user preferences. The authorization flow matches the native checkout experience by using the Venmo app to pass tokenized payment credentials. Code-free upgrade via PayPal’s existing portal connects enables quick deployment by web merchants. It affords users the ability to pay with Venmo at millions of retailers large and small who already allowed checkout via PayPal’s Express Checkout platform. Behind the scenes, Venmo also scaled and matured our fraud detection, consumer protection compliance, customer support operations by connecting to PayPal’s existing services while still meeting our customers’ expectations for simple and fun social payments. As of 2018, 2 million+ merchants can now accept Venmo in native apps and on mobile web and 17% of Venmo users have made a purchase with Venmo. Our first mobile web experience has since been refined into more siginificant personalization capabilities in PP’s core checkout platform. Though this launched after my departure, I’m really proud that the teams jointly delivered on the product vision we defined through our research and design process. In this effort, I led the product definition for the consumer experience, which meant creating use cases, writing user stories, sketching wireframes, and defining presentation-layer logic. I was personally responsible for representing experiential and technical requirements as Venmo’s products were adapted for PayPal’s platform. In addition, as Head of Product at Venmo, I supervised ongoing user research programs, directed the product management and design teams, and led the collaboration with PayPal’s product development teams.